After-school tea time. We try to make time for this every day; it’s a nice way to end our school time. 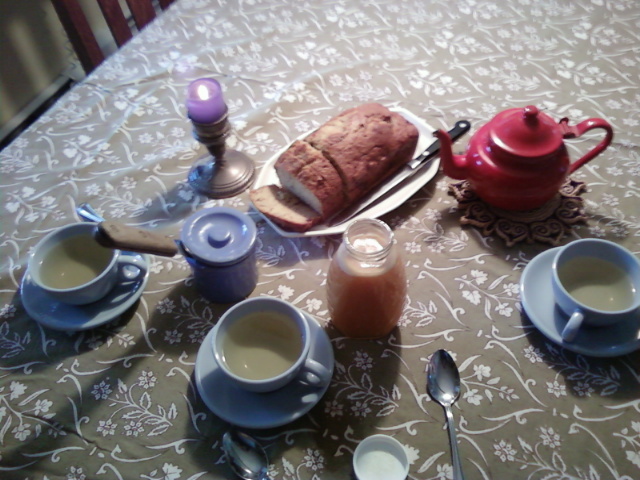 Homemade banana bread, home-grown peppermint tea, and our own raw honey are on today’s menu. What a great ritual, it’s a nice way to cap the day. Just when I think it is not possible to be any more envious, I mean inspired!, of your homeschooling year, you post this picture! LOL My dad raised bees so I grew up on our own raw honey! Mmmmmmm! yes…i need to get back to this. i have let it slip lately. very nice.